In a medium, shallow glass dish or stainless-steel pan, combine the 3 tablespoons soy sauce, the 2 tablespoons lime juice, 1 tablespoon of the oil, the garlic, and the ginger. Add the chicken; turn to coat. Let marinate at least 10 minutes. Meanwhile, in a medium, stainless-steel saucepan, combine the remaining 1 teaspoon soy sauce and 2 teaspoons lime juice, the peanut butter, broth, sugar, salt, and red-pepper flakes. Pour the marinade from the chicken into the saucepan and bring just to a simmer over moderate heat, whisking until smooth. Heat a grill pan over moderate heat. Cook the chicken until browned and just done, 4 to 5 minutes per side. Remove the chicken from the pan and let it rest for 5 minutes. Cut crosswise into 1/4-inch slices. Alternatively, heat the remaining 1 tablespoon oil in a heavy frying pan. Cook and slice the chicken in the same way. In a large pot of boiling, salted water, cook the spaghetti until just done, about 12 minutes. 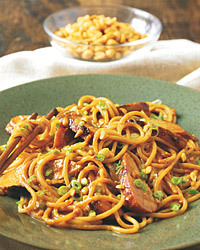 Drain the pasta and toss with the peanut sauce, chicken, and scallions. Top with the chopped peanuts, if using. A little bit of sweetness in the wine would be great with the Asian spices here. A Kabinett Riesling from the Mosel-Saar-Ruwer region of Germany has just the touch and good acidity.